Angiogenesis is involved in maintaining normal physiological processes like embryonic development, wound healing, inflammation and reproduction. Pathogenesis of various diseases like diabetic retinopathy, rheumatoid arthritis and cancer are associated with imbalanced angiogenesis. Angiogenic stimulators and inhibitors act together for keeping angiogenic switch in balance. Recently, miRNAs have been found to regulate various stages of angiogenesis. miRNAs are 21-23 nucleotides long, single stranded, noncoding RNA molecules generated endogenously. miRNA's ability to target multiple genes within a signaling pathway makes them promising target for the development of second generation anti-angiogenesis drugs. This review was conceived with the notion of availability of specific and comprehensive knowledge about AngiomiRs at one place. This will facilitate the research in basic understanding and in the development of new drugs. In this review, we have summarized the biology and therapeutic potential of the miRNAs, which are involved in controlling angiogenesis process. 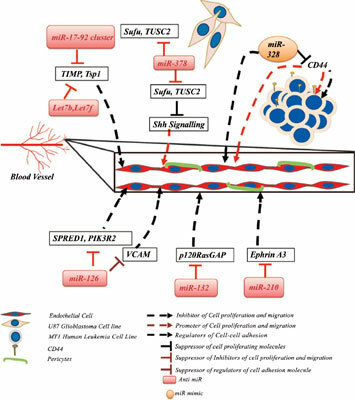 In miRNA biology, we have provided the updated summary of miRNAs in the regulation of endothelial cells, showed role of miRNAs in the signaling pathways of angiogenesis and, discussed the gaps in complete knowledge of mechanism. We have also provided exclusive insights regarding therapeutic potential of these miRNAs, in angiogenesis related disorders. Additionally, we have discussed the challenges in miRNA based drug delivery and updated the current efforts in the development of miRNA delivery methods. Though much research is needed to discover the complete miRNA network regulating angiogenesis but once it is done, targeting miRNA may be considered as a potential candidate for therapeutic invention against angiogenesis related disorders. Keywords: Angiogenesis, RNAi, angiomiR, miR based therapeutics, miRNA, miRNA mimic. Keywords:Angiogenesis, RNAi, angiomiR, miR based therapeutics, miRNA, miRNA mimic. Abstract:Angiogenesis is involved in maintaining normal physiological processes like embryonic development, wound healing, inflammation and reproduction. Pathogenesis of various diseases like diabetic retinopathy, rheumatoid arthritis and cancer are associated with imbalanced angiogenesis. Angiogenic stimulators and inhibitors act together for keeping angiogenic switch in balance. Recently, miRNAs have been found to regulate various stages of angiogenesis. miRNAs are 21-23 nucleotides long, single stranded, noncoding RNA molecules generated endogenously. miRNA's ability to target multiple genes within a signaling pathway makes them promising target for the development of second generation anti-angiogenesis drugs. This review was conceived with the notion of availability of specific and comprehensive knowledge about AngiomiRs at one place. This will facilitate the research in basic understanding and in the development of new drugs. Can Tocilizumab Decrease Cartilage Oligomeric Matrix Protein Levels and Disease Activity in Patients with Long-Standing Rheumatoid Arthritis?